Corner Cabinet encompasses a surprising amount of space on the interior and Marsun offers several accessories so that every inch of that space is accessible and convenient. 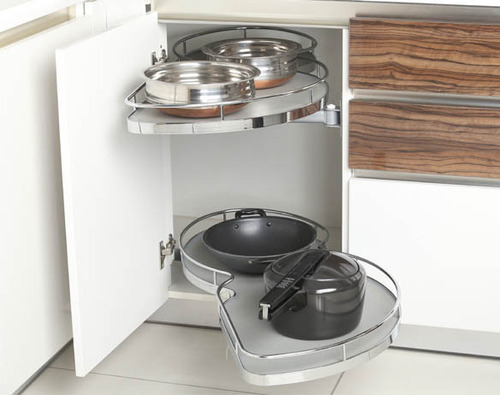 Turntables are a traditional solution and spin smoothly and effortlessly Swiveling Shelves and Gliding Trays also offers a clever options for cavernous corner cabinets, so that the items stored in the Cabinet Glides out for easy access. With the help of efficient manufacturing team, our firm is competent to offer Soft Close Magic Corner Left / Right in various technical terms. Our offered products are extremely applauded in the market due to their consistent performance. We build these products by using sophisticated technology and best grade raw material that gives optimum performance.